Sometimes dinner is more about putting together a few items from the fridge and pantry and less about actual cooking. Last night was one of those times – I had something planned for dinner, but as the morning’s rains moved out, leaving us with a beautiful, warm evening, the meal I originally had in mind seemed too heavy. I needed a Plan B. In addition to my outline of meals for the week, I keep a running list of ideas for quick pantry dinners in my menu planning notebook. Often this list is nothing more than combinations of ingredients that I think would work well together, and I often turn to the list when I need to come up with dinner on the fly. We’re big fans of canned and tinned fish of all types, so we’ve always got some in the pantry. 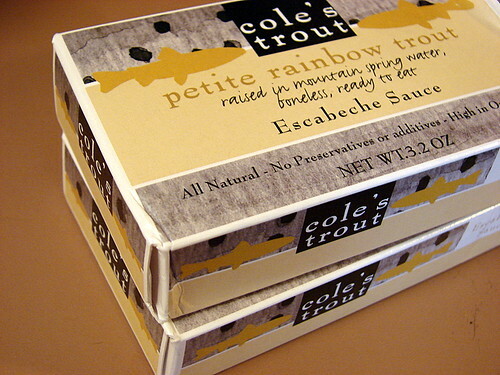 I thought of the two tins of Cole’s Petite Rainbow Trout we had on hand, and decided to go with one of the combinations listed in my little red book: trout+potatoes+mustard. 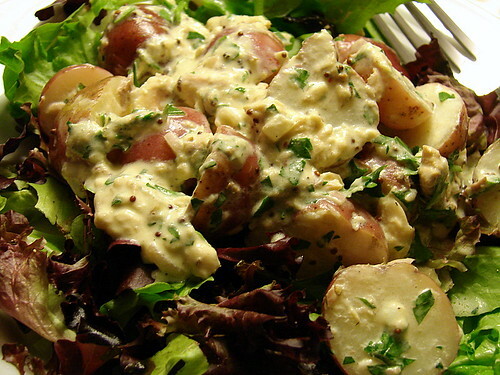 I whisked together a couple of tablespoons each of mayo, creme fraiche and Dijon mustard, fresh lemon juice, a minced shallot, salt, pepper and a teaspoon or so of brown mustard seeds to make a tangy and lightly creamy dressing. I added a good handful of chopped flat-leaf parsley for color and an herbal kick, and then gently tossed the potatoes and trout in the dressing until coated. I mounded the salad over a big bed of baby lettuces, added a little more freshly ground pepper, and that was that – dinner in minutes, with a minimum of time, effort or fuss. I’ve never saw tinned trout before, but I’m a big fan of the idea. Though this reminds me of a very similar dish that I had that used *smoked* trout. I bet that would be tasty, too! Wow, tinned trout. I’ve got to find some of that! I do love potatoes with fish. This is going on my to do list. that’s some easy on hand perfection right there. oof. Just found smoked trout at Trader Joe’s and I’ll definitely be giving this a whirl! We love the Cole’s tinned fishes. Their mackerel and sardines are excellent too – highly recommended if you can get your hands on them. Melissa – smoked trout would be awesome in this, too! This would probably work well with canned crabmeat. Will file away to make this weekend. Thanks.